Danny Tiatto announced his retirement from senior football recently after a long and illustrious 18 year career at both club and international level. 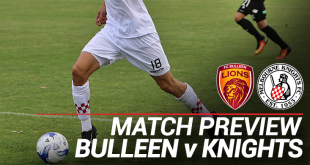 The 37-year-old decided to hang up the boots after the Melbourne Knight’s 4-2 victory over Northcote City in Round 21, opting to sit the last round out, knowing that the Knight’s had avoided relegation. His final performance was one to remember, keeping the League’s leading scorer, Trent Rixon, extremely quiet, before being substituted for Tomislav Ples in the 76th minute. Danny was pleased with his final performance for the Knights. “I was happy, it’s always good to end something on a high, especially winning, and keeping the boys up”. “To finish it off like that, at the club that gave me the first opportunity to move forward in my footballing career was great. It was great to give something back,” he said. He started his career started way back in 1992, with the Bulleen Lions in the Victorian Premier League, where he made 36 appearances over two seasons. The midfielder then moved onto the NSL, playing in the 1994/95 and 1995/96 Melbourne Knights NSL championship teams. Tiatto’s club football resume also included Salernitana, Baden, Stoke City, Manchester City, Leicester City and the Queensland Roar in the A-League. At the start of the 2010 Alanic Victorian Premier League season, Tiatto decided to join the Melbourne Knights for one last season of professional football. “I always said, even when I was overseas, I wouldn’t mind coming back and having a kick around with the old Melbourne Knights and eventually finishing off my career there. It’s worked out that way, and I enjoyed it. After playing in the Melbourne Knights 1994/1995 and 1995/1996 Championship teams, Danny’s football career skyrocketed, leading to 25 caps for the Socceroos. “The Melbourne Knights, at the time, gave me an opportunity to play week-in, week-out, and I was lucky enough to progress from there and make the Olympics under 23 side. “I then progressed to the national side and to play overseas. 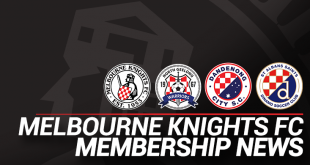 I will definitely hold the Melbourne Knights very close to my heart, and like I said, I’ll always have friends that are involved down there. When asked about any career highlights, Danny alerted to both his club and international scalps. “I think definitely representing the country and playing in the Premier League, one of the best leagues in the world, were real highlights for me. Daniel Tiatto has had quite an astonishing career, both on and off the pitch and is a true ambassador and icon of the Melbourne Knights FC.